Avon Calls on E2open for Better Supply Chain Performance - E2open | Demand. Supply. Delivered. Avon has a widely distributed supplier and sales base, short product lifecycles, and a constant flow of changing promotions that influence demand. 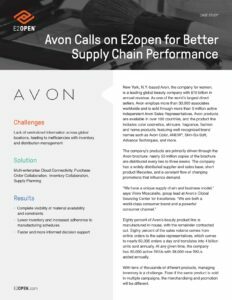 Learn why Avon chose to work with E2open to develop a supply chain solution specifically for its unique business model.